Robert Putnam, the author of Bowling Alone, argues that the time has come "to reweave the fabric of our communities." Ahmed Rashid, the Pakistani journalist and author of Taliban, shares insights he has gained from years of unparalleled access to Afghanistan and its radical Taliban movement. His 1958 novel, Things Fall Apart, marked a turning point for modern African literature. In his new book, Home and Exile, Chinua Achebe sees postcolonial cultures taking shape story by story. Julia Alvarez, the Dominican-born novelist and poet, talks about her new historical novel, In the Name of Salomé, and about her need to write the stories that are hardest to tell. Richard Powers -- a writer who connects technology, art, and politics as few others can -- talks about his new novel, Plowing the Dark, and the age-old human search for the virtual and the eternal. David Brooks, the author of Bobos in Paradise, explains why bourgeois bohemians are here to stay. Sherman Alexie -- poet, novelist, short-story writer, Native American -- strikes out at the "eagle-feathers school of Native literature." More interviews in Atlantic Unbound. Join the conversation in the Books & Literature conference of Post & Riposte. Five years have passed since Kazuo Ishiguro published The Unconsoled, an ambitious novel experimental in form and significantly different from the work that had brought him to prominence -- books such as the commercially and critically successful Booker Prize-winner The Remains of the Day (1989), and the novels An Artist of the Floating World (1986) and A Pale View of Hills (1982). Unlike his first three novels, precise and subtle stories with unreliable narrators attempting to come to terms with their war-time pasts, The Unconsoled features a narrator who is by turns omniscient and clueless as he wanders through the surreal landscape of an unrecognizable modern European city. Many critics and readers didn't seem to know what to make of it. With his new novel, which has been short-listed for this year's Booker Prize, Ishiguro returns to territory familiar to readers of his earliest work while incorporating elements of his last novel. When We Were Orphans is the story of Christopher Banks, a London society detective in the 1930s who returns to his native Shanghai to solve the mystery of his missing parents, whom he believes were abducted from the city's International Settlement when he was a young boy. Like most Ishiguro narrators, Banks speaks with a careful, overly formal voice, and as the story progresses it becomes apparent that Banks's image of himself is at odds with the impression others have of him. Stumbling into the outbreak of the Sino-Japanese war in 1937, clinging to the child-like belief that he can contain the evil breaking out in the world by finding his parents, Banks moves through London and Shanghai driven by nostalgia and a primal desire to put things right even as the world grows more bizarre and menacing. 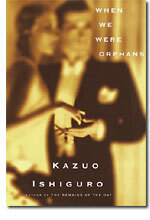 Conflating the collapse of a child's world with the impending cataclysm of World War II, When We Were Orphans is a classic Ishiguro novel, exploring the themes he's most moved by: the distortions of memory, the upheavals of history, and the effects of alienation. 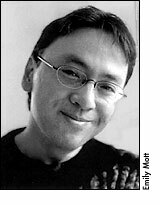 Ishiguro, who was born in Japan in 1954, has resided in England since 1960. He recently spoke with Atlantic Unbound's Jessica Chapel. All of your novels -- with the exception of The Unconsoled -- are set during the World War II era. What is it that draws you to this historical period? When I started to write my novels, around 1980-1981, I was quite preoccupied with Japan and the militaristic period it went through, and then the war. In some ways that's not surprising. If you are someone of Japanese or German origin, there is a stronger inclination to wonder how you would have behaved had you been born just one generation earlier. This is a question I was asking from a position of some comfort and safety -- I was living in England, and though it was the time of the Cold War, there was no real danger of fascism taking over. I suppose I feared that my generation was in danger of becoming slightly complacent about certain things. We took up political positions very easily. It was kind of an exercise on my part to imagine what I would have done had I been born just a few years earlier than I was. Would I really have had the strength of mind and clarity of vision to not go along with that kind of fervor or would I have been swept up as well? My first three books arose out of that kind of inquiry, looking at what happened before and after a big cataclysm. I think there is also some tendency on the part of writers my age and younger -- certainly in Europe and perhaps to some extent in America -- to have a sense of the present as boring or dull. Of course, we don't feel that it is dull in the everyday sense, but when we are looking for settings for big themes it sometimes seems that we're inclined to go back to a time when things were really up for grabs. I feel slightly weary of this tendency, and I think perhaps there is an element of imaginative laziness there on our part. But it's certainly been a trend, and when I started to write there was a very strong climate that encouraged us to do this -- that we should go for big themes, that we should be writing about history and wars and the big clashes of idealisms, instead of just writing about our provincial lives. Is it possible that those of us born since World War II and living in Western democratic societies lead such comfortable lives that we can't grapple with these questions? Many contemporary authors just don't seem able to write about great passion or great evil. Yes, absolutely. I think this is very much a question that preoccupies a lot of writers -- particularly writers who have become self-conscious about the way they write and why they write. Before the Iron Curtain collapsed, I think there was a sort of envy among Western European writers toward writers living in oppressed Communist countries, because for them the very act of writing seemed to be terribly serious. I think everyone realized that this was a very decadent kind of envy, but it was still there. Now I think the questions have changed. It's all very well to say that wars or revolutions are bigger, that a love story somehow becomes more profound if it's set against the backdrop of the Cuban revolution or the Russian revolution, but that's not always true. There is a difference between being big and being deep. To achieve depth in art and in fiction you have to look at small things, things that aren't always obviously important in a history-book sense. I think that's often what we go to novels for -- that depth. America perhaps has a peculiar problem at the moment. American culture is dominant throughout the world, and there is less incentive for American writers to look beyond their own society and what is on their doorstep. I think the British went through this until the end of the British Empire. There was the assumption that you could write a novel of global importance just by writing about British or English problems. And if somebody in China or somebody in Buenos Aires wasn't interested, well, they damn well should be, because Britain was the dominant power in the world and so British culture by definition was important. I think America may be in that position now. A writer describing what it's like to grow up in a particular neighborhood of New York automatically gains a kind of global significance simply by virtue of American culture's current dominance in the world. The trouble is that you can get a certain inward-looking society. You can start to feel that you don't have to look further. I am not accusing American writers of doing this, but that kind of climate has affected British writers for a number of generations, and I think it could be affecting American writers too. I think if you understand that, then you start from a position of looking outward. Let's talk a bit about The Unconsoled. It was a very different novel in terms of tone and structure from some of your earlier work. What gave you the idea for this book, and did you find it difficult to maintain the tone and structure of the novel? To take the first part of that, I think I was prompted by the sense that the assumptions from which I had written my earlier novels didn't necessarily fit with what I was experiencing. My first three books were a young man's novels in that they assumed that life was about having principles and political values, and the success of your life could be measured by how well you'd worked out those initial principles and how well you stuck by them. My early novels, including The Remains of the Day, have this assumption built right into them -- a man or woman looking back and struggling with the sense that they had failed to live up to their ideals. But as I got older it occured to me that there was something unsatisfactory about this whole way of looking at life -- my own life seemed to be far less in control than I once assumed it would be. You can have a lot of principles and values and things that you declare you will and won't do at the outset, but once you are actually out there, how you end up living seems to me much more about what fate allows you to do, what other people's obligations allow you to do. We take a rather zig-zaggy path through things. We are just kind of blown around by chance, by opportunities that open up and opportunities that close. The Unconsoled was an attempt for me to try and put into a novel what I felt was the actual structure of life. Were you surprised by the reviewers' responses to it? Many seemed to find it befuddling. Quite aside from what I just said, from a novelistic point of view, it's a very strange book. I mean, it breaks a lot of rules. I really didn't know how people would receive it. It also followed The Remains of the Day, which was a very different kind of book. And perhaps more significantly, it came out only about a year or two after the movie of The Remains of the Day. So I think a lot of readers expected The Unconsoled to be something like The Remains of the Day or the movie, and they weren't fully primed for what was there. It's a difficult book, but it has had an interesting career here in England. Probably a lot like in America, it opened to pretty unfavorable reviews, though there were some strongly favorable ones as well. Predominantly people seemed baffled or angry or something. But over the years that book seems to have acquired a reputation here in England. It cropped up on lots of those end-of-the-century lists when people were rounding up things. When my new book was published here in April, a lot of the reviews spent about a third of the space discussing The Unconsoled and kind of reassessing it. And you would think from those reviews that it had gone down as a big success at the time. But you know, I don't pretend for one moment that it's an easy book. I think The Remains of the Day or those shorter books are much easier. But sometimes you don't have a choice when you are trying to do something -- you end up doing something odd and rather complicated and it might not be to everybody's taste. My hope is that as the years go on, people will feel it does say something you don't find in many other books. Suzie Mackenzie, in her profile of you in The Guardian, suggested that When We Were Orphans is a rewrite of The Unconsoled. It's not a rewrite in the very obvious sense that it's a completely different kind of book, which will be clear to anyone who opens it for just a few minutes. Its technical unfolding is entirely different. Now, in terms of the themes -- the themes at the heart of When We Were Orphans are very much related to those in The Unconsoled. Both books are about people who want to think that they can fix something that's broken in childhood, years ago. Both books have that, and in the case of Ryder, the pianist in The Unconsoled, he believes that if only he had been a better pianist as a boy his parents' marriage wouldn't have been the rather hellish thing that it was. Years later he becomes a very fine pianist, but of course it's too late. In that way it's a similar story to When We Were Orphans, though it's an entirely different kind of novel. Christopher Banks's parents disappear when he is a child, and he grows up believing that he can find them and turn back the clock -- that they'll carry on where they left off, and he'll pick up a kind of happy childhood again. Why make Christopher Banks a detective? My starting point was what is often referred to as the Golden Age of detective novels. English detective novels, writers like Agatha Christie and Dorothy L. Sayers. I was fascinated by the very cardboard nature of the genre -- the fact that they didn't even aspire to be realistic. It struck me that the whole appeal was that they weren't realistic. Of course, it's a truism that most escapism is entertainment. That's why we like it: we escape from the real world. But the English detective genre seemed to be peculiarly wanting to avoid anything that resembled the real world. The characters are drawn almost deliberately in a two-dimensional way at times, particularly in the whodunits. That's slightly unfair to some of Dorothy L. Sayers's novels, which do sometimes have deeper characterization. But there are a lot of these whodunits that are almost like board games that have been written up -- they're like crosswords. But it was this very attitude that fascinated me, because these books were very popular after the Great War. It was a vision of the world that people found comfort in at the time they were getting over this horrific trauma. This was a generation that had experienced modern warfare for the first time, and it was interesting to me that they should create this particular form of escapism. Often these detective novels would portray a beautiful village, a tranquil English village, and just one thing had gone wrong -- somebody was murdering somebody. But all it took was one detective to come from the outside and unmask the murderer and society would be beautiful again. Once the murderer is unmasked, once you discover that it is the vicar's wife that's been poisoning everyone in the village, there's very little sense of post-murder trauma, even though five or six people in this small English village have been murdered in the space of two weeks. At the end, when the detective's leaving, everything is fine and everybody's terribly happy, and most of the subplots that in hindsight you realize had nothing to do with the murder mystery, they've all been resolved as well. The quarreling couple have made up, and the old soldier who's drinking too much has stopped drinking. Everything has been healed. In its historical context I think this kind of escapism is quite poignant, this hope that there's a detective who can just put the evil back in the bottle. This wasn't really a hope -- you can see from the way these books are written that no one is pretending this is for real. It's just a kind of longing for a more innocent period of life that's gone forever, after the Great War. I thought it would be interesting to have a detective who seems to come out of this cardboard world, perhaps carrying a lot of those assumptions about how you can control evil, and throw him into the turmoil of the twentieth century as it runs toward the Second World War and see what happens to him. Banks seems to be driven by nostalgia. There is the passage, for instance, where he thinks he is with his childhood friend Akira, and he says that when they were boys "they lived in a good world." Is he trying to recreate that world by going back? Well, I suppose that my suggestion is that for many of us nostalgia is a very important emotion. I talked about this in that piece by Suzie Mackenzie as well. I am not referring to the sort of tourist-industry nostalgia invoking past eras. But the pure human emotion of nostalgia harks back to childhood, perhaps before we discovered the world for what it was and what it is. Even if most of us are fortunate not to have gone through a trauma as Christopher Banks did in childhood, we must all come out from our sheltered world as children into the adult world. And my guess is that many of us harbor a kind of disappointment that the world isn't quite the place that adults led us to believe it was when we were young. In some ways I think that nostalgia can be quite a positive emotion. It does allow us to picture a better world. It's kind of an emotional sister of idealism. I think to some extent that this is what When We Were Orphans is about. It's about the fact that we all made a journey out of some sheltered bubble. And there's a part of us that knows that we can't ever go back into that protective bubble. But there's an irrational part of us that hopes we can somehow fix things and we can make the world a much more enchanted place. Mackenzie suggests in her article that you feel that way about Japan, particularly since you've only gone back to Japan once since your parents moved to England. She speculates that this is because you always thought of it as a temporary move or imagined Japan remained as it was before you left it. In profiles of that sort there is always a tendency to find echoes and parallels between the author's life and work. I am not utterly convinced that this is where all of my stories arrived from -- that I feel some sort of nostalgia for the Japan of my childhood, therefore I write about these things. It's a little too neat. But I've read it more than once and it's not objectionable, and in a way you need a neat thing. It's not entirely untrue either. I think part of the reason that I am drawn to memory and nostalgia is because in my own experience these things have been crystallized very sharply. My early childhood is very clearly marked off geographically, and in terms of the people around me, in a way that perhaps it isn't for someone who has grown up in the same place. You know, for me there is this ready-made emotional shorthand of Japan, standing for my early childhood -- a more innocent, protected life -- and then there's Britain, when I was older and had to face the world. But perhaps this is a more universal thing. Of course, many people don't make a geographical move or cultural move of that sort, but what I'm suggesting is that most of us have had to make that very big move out of that protective world of childhood. We've made a journey out of that world into the world that we have to live in. And that I think is a universal thing. Jessica Chapel is the production manager for Atlantic Unbound. Her most recent interview was with Sherman Alexie. All material copyright © 2000 by The Atlantic Monthly Group. All rights reserved.